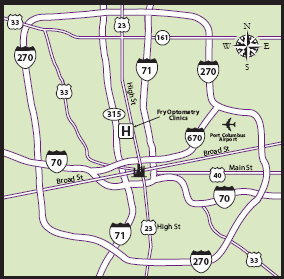 Columbus is served by four major freeways: I-270 loops around the perimeter of Columbus and its suburbs; I-71 is the major north/south interstate; and I-70 is the major east/west interstate. Route 315 is a north/south freeway that serves the northwest section of Columbus and provides the best access to the University Medical Center. Take SR 315 north. Exit on the right marked Medical Center, King Avenue Exit. Continue straight onto west 9th Avenue. Turn left on West Park Street and park in the Visitor Garage on your left. 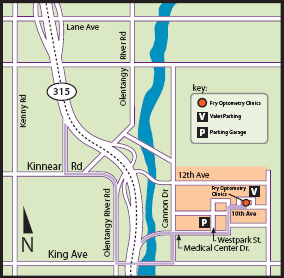 Walk east on 10th Avenue and turn left onto Medical Center Drive. Turn right on 10th Avenue where you will find the College of Optometry entrance at 320 on your left.